Particulate matter is a form of air pollution. 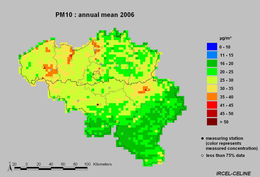 Airborne particles less than 10 micrometers in size are considered to be particulate matter. Epidemiological and toxicological data show that particulate matter is harmful to a person’s health upon inhalation. The areas of London, Amsterdam, Rotterdam, Antwerp and the Ruhr Area are considered to be the worst sources of pollution in Europe. In the Netherlands and Belgium the concentration of particulate matter mainly exceeds the limits within 100 metres of a busy motorway or within 50 metres of a busy urban road. 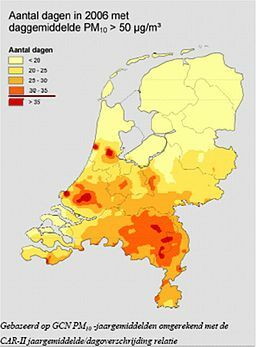 In major cities in the Netherlands, up to 10% of the population is exposed to excessive amounts of particulate matter (data from 2004). The limits are set based on the number of days a year when the daily average of the particulate matter concentration exceeds 50 micrograms per cubic metre. LPG engines produce significantly less NOx and particulate matter than diesel engines when running. Most EU Member States subscribe to these environmental benefits and apply a low duty rate to LPG. CO2 (carbon dioxide) emissions are an important indicator for a sustainable living environment. LPG is one of the cleanest fuels measured in CO2 emissions. With the introduction of stricter environmental standards, LPG offers a positive contribution to a cleaner environment.